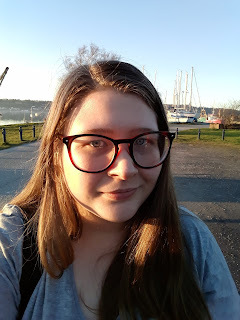 Today's blog post is a little different if this is the first post you've seen, or you have missed a day see the links for Lily, Aoife, and Emma. When I got an email asking if I would like to participate in a collaborative blog tour for Floored, I was a little hesitant. Let's just say I have one too many bad experiences of group projects that I like to avoid them at all costs. Only this has been the most wonderful experiences I've had. Its been an honor to work with these six bloggers and see what we came up with creatively. God, the North is ghastly. Instead of using Hugo, I had the idea of Richard-James Briath. I'm not one for talking about my writing so I'll leave you to read and if you would like to comment, please do, but don't be mean! God, the North is ghastly, thought Richard-James as he witnessed the changing landscape. would have let her sleep in and get the later train to the conference. his first-class, window seat on the 0607 Virgin West Coast Train to Blackpool. 06:47 | pls tell me you at least some id?! holiday and keep to the complicated facade of the tech conference. 07:01 | what is that meant to mean? tongue, its how he got his reputation as the no-nonsense businessman that most people try avoiding. on this train. You're tired? Take a nap!" meant to be heading in. And the Uber app isn't very either. "Manchester? Manchester!" exclaims RJ. "How else am I meant to hail a cab?" RJ really didn't like the North. "You ring up." A man's voice answered and hands over a card for Premier Taxis. The man did a sort of hand bob in thanks before heading out of the station and onto the street. "Hello, Premier Taxis," a woman greeted RJ on the other side of the phone. "Hi, yes, could I book a cab please?" "We haven't got anything for fifteen minutes, that okay?" "That's all booked for you know." went in and found the desk straight away. "Good morning!" Greeted a woman on the desk. "I have a room booked for the weekend." Her badge read that her name was Emily. silence might be enough to make her squirm. It worked. "Name?" "Thank you, Emily. Before I forget, who do I need to talk to about the conference?" you ticked off the list." schedule and his pack. He turned and walked towards the boy, Elvin, that Emily had pointed to. "You here for the conference?" "Have you got your company pass?" "Well, you see," began RJ. RJ assumed was his name. "Got any ID on you?" Elvin with a driving license and his office ID. valuables... up to your room and come down before the convention starts." "Convention? Thought it was a conference." "Convention? Conference? Their pretty much synonyms." "Easy to discern, one is full of scrawny geeks and the other full of - "
Floored is a one-of-a-kind collaborative novel written by seven of the UK's (ok the WORLD'S) finest Young Adult authors: Sara Barnard, Holly Bourne, Tanya Byrne, Non Pratt, Melinda Salisbury, Lisa Williamson and Eleanor Wood. Told from the perspective of each character and a mysterious narrator, Floored is about all the ups and downs of life. After they go through a traumatic experience together, the lives of six strangers become intricately intertwined, and they decide to meet once a year to commemorate the day they met. Each character, each chapter, each story told – the writing of Floored was a truly collaborative process right from the start. From picking a distinct and interesting character and deciding on the book’s larger narrative arc, to figuring out who was going to fall in and out of love over the course of the book. 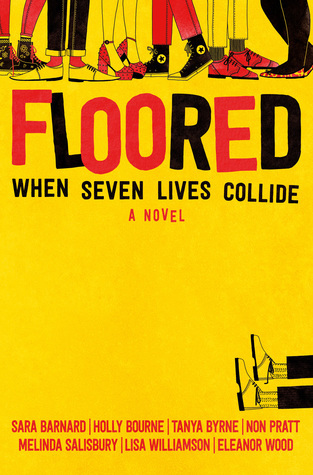 Floored is a novel of consequences, six stories seamlessly woven together by seven hugely talented authors. With so many different imaginations at work brilliant and unexpected things could – and would – happen.